When I first met Joe I was in his living room wearing pyjamas with my mascara halfway down my face. I had been painting the town red the night before with his housemate – my good friend Helen, and had ended up staying the night on their sofa. Luckily he didn’t hold this against me. 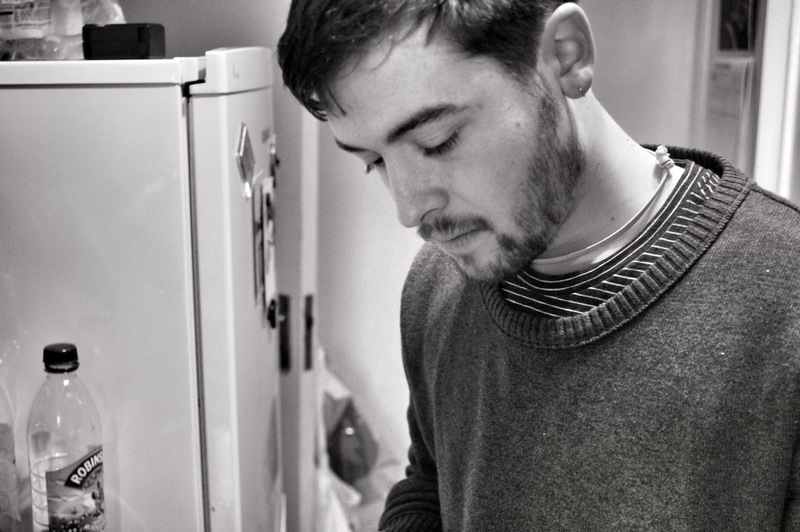 About a week ago Helen mentioned Joe had started making goat’s cheese in his spare time! Urrrm…AMAZING! So on Saturday I managed to convince Joe to let me watch him make his latest batch in exchange for a slice of cake, a coffee and the link to the YouTube video where Harrison Ford pierces Jimmy Fallon’s ear! 1) People who sell cheese don’t make the cheese or know where you can buy milk. But, there is a marvellous selection of French Cheeses on Broadway Market. Plus, the people on said cheese stall said that if we found a goat they’d be happy to look after it for us. d) fresh goat’s milk has lots of goat hair in it. 3) We couldn’t find any goat’s milk in Spitalfields either…although there is a statue of a goat which we felt was misleading and was most definitely mocking us. 4) There’s a company at Borough Market called “the greedy goat” and they sell goat’s milk icecream, but they don’t sell the milk. They also told us that Neal’s Yard Dairy doesn’t sell it either but asked us to ask them anyway to show them there’s a demand. 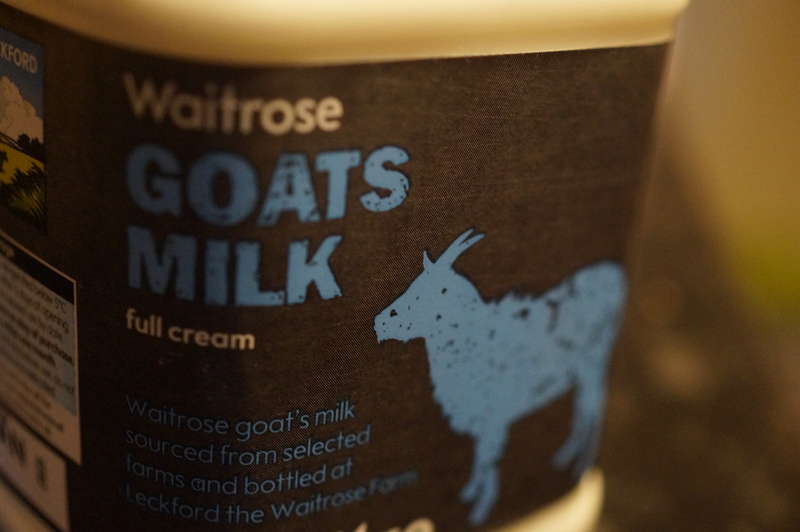 6) Waitrose near the Barbican does sell full cream goat’s milk!!! SUCCESS! 1) Put 50ml of boiling water into a jug or other heatproof container. When the water has cooled to room temperature add 1 teaspoon of citric acid, stir thoroughly until it dissolves. 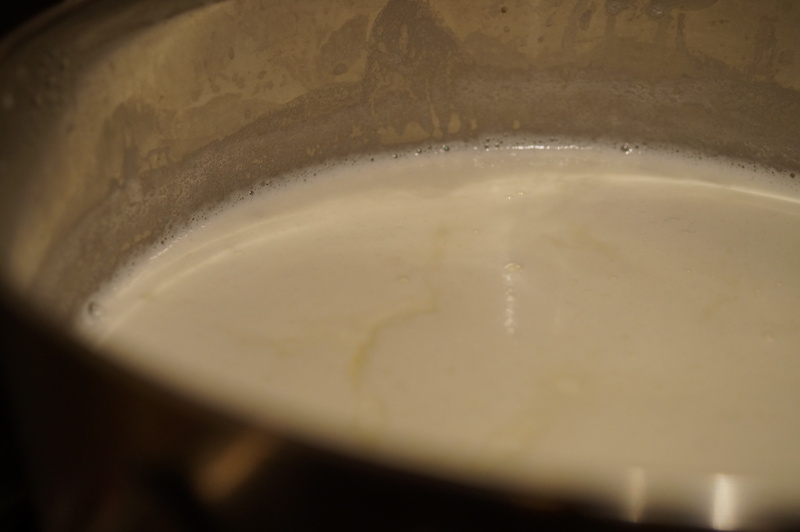 2) Put 2 litres of whole (full cream) goat’s milk into a large saucepan. 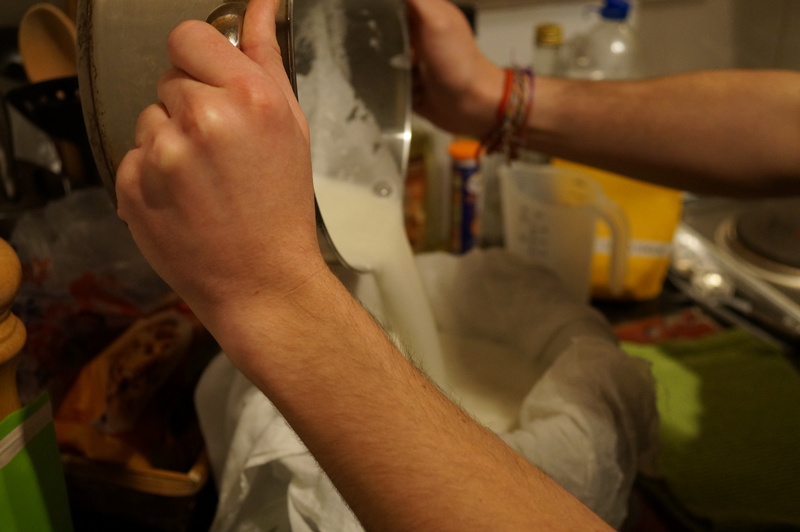 3) Stir the milk with a large spoon and with a “lifting motion” mix in the citric acid. 5) When it reaches the correct temperature take the pan off the heat and leave to stand for 30 minutes or until there are what look like yellowish cracks in the mixture. 7) Pour the milk mixture into the lined colander. This will allow the whey to drain out into the bowl below leaving only the cheese in the cloth. 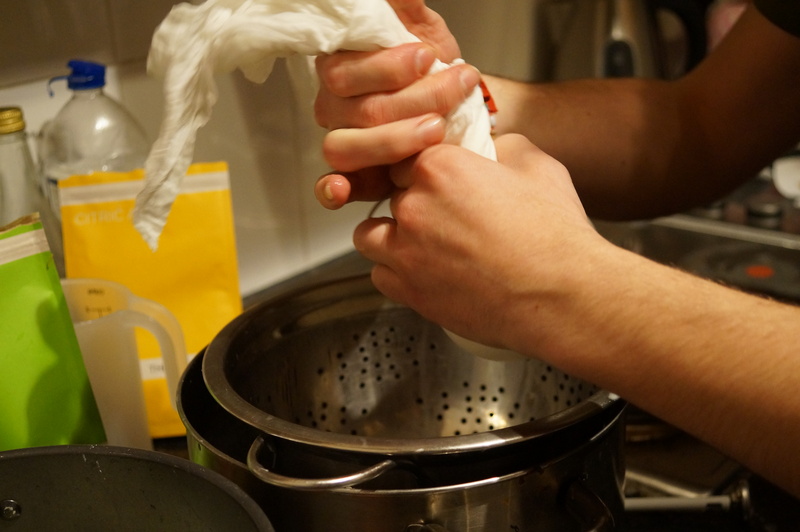 8) Stir in some salt (and some herbs too if you like) then twist the corners of the cloth up together to encase the cheese and squeeze out more of the whey as you do so. Goat’s Cheese & Red Onion Tarts: Line a greased bun tin with rounds of puff pastry then fill them with a mixture of fried red onions and onion chutney (or onion jam). Top with small pieces of soft goat’s cheese and a sprig of thyme. Bake in the oven at 190°C for around 15 minutes. As well as a pretty decent quantity of cheese you will notice that quite a large amount of whey is also produced. Joe said that from his research the main uses for excess whey were beauty related, and that some people even take baths in it! 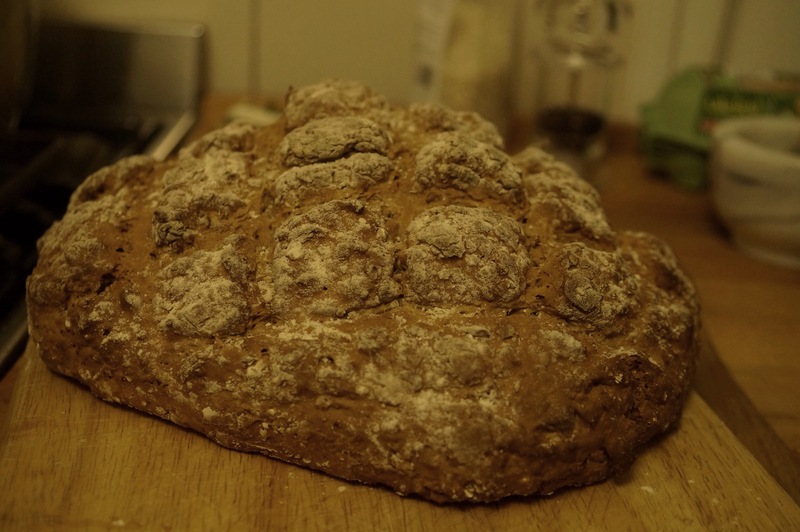 None of our housemates seemed keen on soaking themselves in thin goaty milky liquid but everyone munched the whey based soda bread I hurled together, which I jazzed up with some black onion seeds and fresh thyme. I’m still swimming in whey (not literally), so this morning I made pancakes with it too. Whey Pancakes: Mix 1 cup of plain flour with an egg and whisk thoroughly. Gradually add 1 cup of whey and whisk until smooth. Stir in a teaspoon of caster sugar and 1/2 teaspoon of bicarbonate of soda. Use this batter to make small pancakes in a non-stick pan which has been greased with a little bit of vegetable oil. I served mine with some of the cheese, pomegranate seeds and maple syrup (although honey would be great too). And finally. After all that, I STILL have some whey left, so I decided to test the theory that whey is super-fantastic for your skin by making a foot soak. Whey & Lavender Foot Soak: In a pan I mixed 300ml of whey with 300ml of water. Then I added 1 teaspoon of dried lavender flowers and 1 teaspoon of honey. I heated the mixture gently until the honey had dissolved but the mixture wasn’t yet simmering. I then passed the mixture through a sieve to catch all the Lavender flowers and popped it into a large bowl ready for my toes. Once it had cooled enough to touch I popped in my feet. The bowl wasn’t quite big enough (should’ve checked this really) but it did the job. I left my feet to soak until the liquid cooled down to room temperature and I got bored, but I must admit it felt pretty good. I don’t know of that’s the whey or just the fact it was nice warm water on my feet but either way I tried it and whey was used – huzzah! *in my last blog post about crumble I struggled to find rhubarb, since then it seems to be everywhere. So I bought some, simmered it in water with some juniper, star anise, slices of oranges and lemons and then sweetened it with a dash of honey. When soft I scooped out the rhubarb and served it with some smoked mackerel and a few rocket leaves dressed with lemon juice and black pepper. I then picked out the spices and citrus fruits from the simmering liquid and reduced it down to a (still quite thin) syrup. When cooled you can dilute this with fizzy water for a fancy rhubarb cordial! Whoop!